Salt for dyeing is easy to come by and fairly inexpensive. There is non-iodized table salt, water softener salt, kosher salt, rock salt - the list goes on. What is not easy to come by is a salt that dissolves instantly! We get asked all of the time if there is something easier to use. Well, there is. We have access to powdered salt in bulk. The consistency is kind of like powdered sugar. Add it to your dye-bath and it dissolves with barely a stir or agitation. Voila! Salt is cheap, shipping is not, and that is why we have never heretofore offered salt for sale. But folks have asked, and it is selling, so we are now offering it to you in 5 lb. bags and 25 lb. boxes. One 5 pound bag is about 9 cups or so. 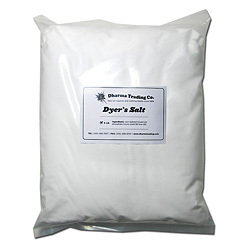 It is more expensive than regular salt, but we have found it totally worth it when dyeing - a big time saver. Now you can decide. Some have astutely notices that with the particles so fine, that one cup of this salt should be denser than other salts. If you want to get scientific and hopefully save a little money and make your powdered salt go farther, weigh a cup of the salt you normally use for dyeing. Then weigh out our powdered micro-salt until you get the same weight, and see what the volume is. Then substitute that volume from now on for each cup of the salt you used to use. Dharma was unable to figure this out for you because there are so many different grades of salt out there, and the only salt we buy here is the powdered. Ingredients: Non-iodized micro-sized 66 mesh fine salt (NaCl) plus Tricalcium Phosphate as an anti-caking agent. *Note - exposure to any moisture whatsoever during storage will cake it anyway, but it will still dissolve fairly fast if you break it up, it's just harder to measure. Had quite a few clumps in it that I had to break up. However this didnt seem to cause any streaky results or mess anything up. This salt is much finer than what you will find at your grocery store which makes it much easier to dissolve. This salt really does dissolve fast so glad I tried it! This is the best disolving salt. This product is great and saves so much time! It dissolved instantly. I hope you continue to carry this product. For me it is worth the extra few dollars! Makes the dying process shorter! I keep this on hand and never run out. Perfect compliment to the other products I use from Dharma! Thank you so much! Dissolves very quickly and completely. Yep it's salt! How2ever the shipping is just great the package was shipped the same day it was ordered It doesn't get better than this.